YSRC chief promises 75 per cent jobs to locals if voted to power. Anantapur: YSRC chief and leader of the opposition in the Assembly Y.S. 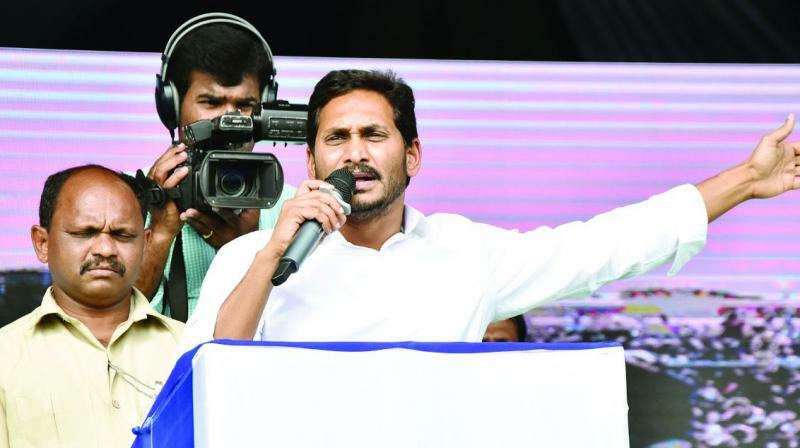 Jagan Mohan Reddy promised to bring a GO towards providing at least 75 percent of jobs for locals in the state. Reacting to the issue that unemployed youths brought that Kia Motors India failed to offer employment to locals but employed Tamil Nadu people in the Penukonda unit, Mr Reddy stressed the need for justice to local educated youths. “Government has given free land, power, and other facilities for establishment, but Kia failed to provide even a small fraction of the jobs to local people. If the YSRC comes to power, the first bill that we will pass will be to reserve 75 per cent jobs for local people if voted to power. This will not just be for new companies to follow, but also for existing companies. This will be applicable for Kia Motors too,” Mr Reddy stated. After interacting with village-level neutral influencers in Hyderabad, Tirupati, and Kadapa, Mr Reddy met with 300 influencers at a private function hall here on Monday. During the fourth Jagan Anna Pilupu interaction, an open discussion in which the attendees put across their points of view on the pressing issues of their regions and suggested potential ways to address them. Mr Bharath Reddy of Dharmavaram lamented over the unemployment problem and failure of Kia Motors to provide minimum opportunities to locals. However, only Tamil people are being given preference for top jobs, while people from AP are working for lower grade sections such as sweepers and watchmen. Mr Pulla Reddy, professor in the Law Department of Sri Krishna University, stated that there is a shortage of faculty. “When I joined the Law Department there were 12 lecturers, but now there are only two. Any new vacancies are being filled through contractual employment only,” he said. TD MPs were elected to the Lok Sabha with help from the BJP and have not resigned from their posts till date. After the BJP refused to accord Special Category Status to the state, Mr Chandrababu Naidu is in Delhi on Monday on a deeksha as the last session of this Parliament is going to end, according to YSRC chief Jagan Mohan Reddy. Interacting with booth-cadre under the third ‘Samara Shankaravam’ banner with 55,000 booth-level workers of all levels of the party here on the outskirts on Monday, Mr Reddy observed that this was the first time any political leader from AP was interacting with booth-level workers on such a massive scale. Alerting party cadres, he observed that Mr Naidu was using intelligence officials and identifying YSRC leaders who can influence a few hundred votes and trying to buy them.